On 30 April 1913 WSPU headquarters at Lincoln’s Inn House in Kingsway were subjected to their first police raid. See here for a photograph (Museum of London) showing a subsequent raid in progress. 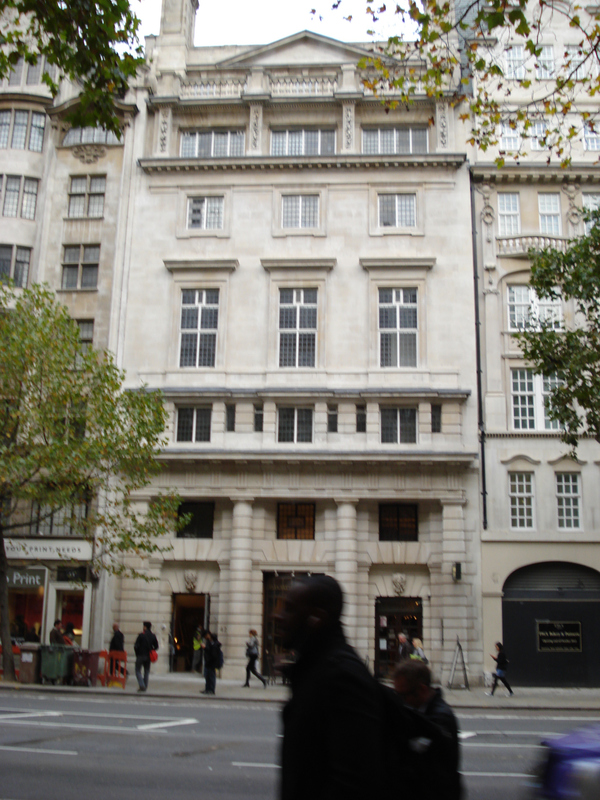 The WSPU had moved into the imposing new office building during the summer of 1912 – vacating their previous quarters in Clements Inn which had been very much Pethick-Lawrence territory. The geographical separation heralded the political separation that occurred in October 1912 when the Pethick-Lawrences were dismissed from the WSPU. 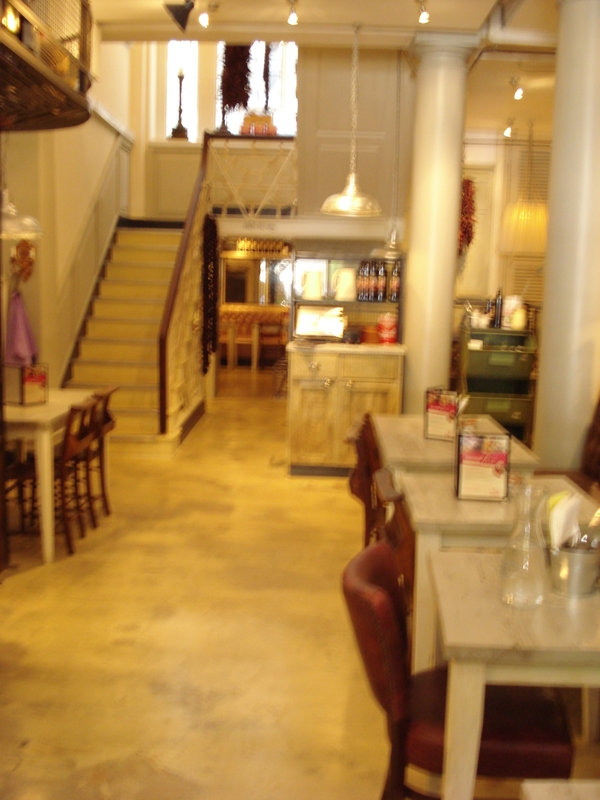 The elegant and imposing entrance hall of Lincoln’s Inn House -through which both suffragettes and police once purposefully made their way – and its mezzanine floor – is now a ‘Bill’s Restaurant‘. 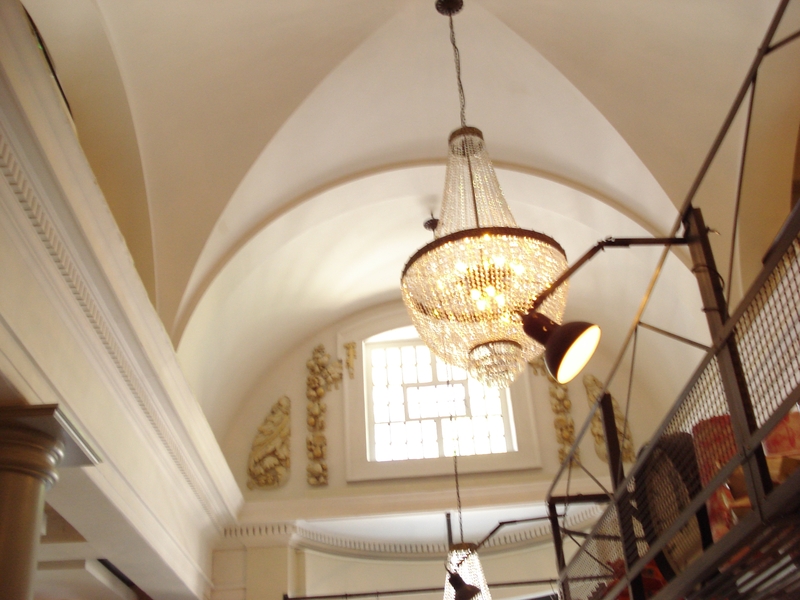 I doubt that the bones of the space – the pillars, the stair case and the ironwork – have changed much in the last century and it is not difficult to imagine – as one sits eating one’s ice cream on a warm summer’s morning – the shades of our foremothers going about their business here. The police raid was one element in the increasing Home Office crackdown on the WSPU which had begun in February 1913 when, on the day after a house being built for Lloyd George had been damaged by a suffragette bomb, Mrs Pankhurst declared,’For all that has been done in the past I accept full responsibility. I have advised, I have incited, I have conspired.’ The speech was seized on by the Home Office as the opportunity for which they had been waiting to arrest Mrs Pankhurst. She was charged with procuring or inciting women to commit offences contrary to the Malicious Injuries to Property Act and on 2 April was found guilty and sentenced to three years’ imprisonment. She immediately went on hunger strike. See here for the article on this episode commissioned from me for the No 10 website. 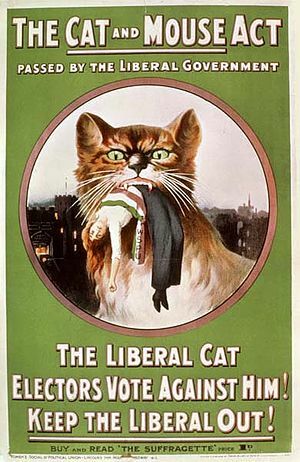 It was no coincidence that a day later the bill that was to become known as the ‘Catand Mouse Act’ received its Second Reading in Parliament. The passage of this Bill demonstrates how quickly Parliament could move when the Government was determined to act, for the Bill rapidly became an Act, receiving its Royal Assent on 25 April. At the beginning of April both Annie Kenney and Flora Drummond were also arrested, the Home Office invoking obscure statutes to ensure that they would appear before the courts. A few days later managers of halls were encouraged by the Home Office no longer to let to the WSPU, who were also proscribed from holding meetings in public parks. This is the context in which the raid on Lincoln’s Inn House should be seen. The chief office organizers, Harriet Kerr, Beatrice Sanders, Rachel Barrett, Agnes Lake and Flora Drummond were arrested and were to spend most of May in front of the Bow Street magistrate, Mr Curtis Bennett. The police, under the command of Inspector Quinn of Scotland Yard, loaded a pantechnicon with WSPU papers seized from Lincoln’s Inn House, papers, incidentally, which were never returned. I must say I lament their loss as they would most certainly have shed more factual light on the workings of the WSPU – Emmeline Pethick Lawrence had been a very business-like manager. In their absence the WSPU story has had to rely to a great extent on hindsight memories and the information culled from Votes for Women and The Suffragette, sources biased in a way that business letter, receipts and account books are not. As part of their campaign to cut off WSPU funding, the Home Office intended to trawl through the records seized in order to discover the names of WSPU subscribers and then prosecute them for supporting an organization that encouraged its members to damage property. This plan was never put into practice. The Home Office did, however, prosecute the printer of the WSPU paper, The Suffragette, driving the paper underground but never preventing its publication. On 2 May the Home Office asked the General Post Office to cut off all telephone communication with Lincoln’s Inn House; but the GPO replied that it was not entitled to do so. These attempts at suppressing the WSPU had, as might have been predicted, the effect of creating a void that was filled by even more extreme words and deeds. Between February and April there were over 30 arson attacks ascribed to the ‘work’ of suffragettes, as well as many lesser attacks – on golf courses, letter boxes etc. Moreover, when combined with the publicity given to Mrs Pankhurst’s successive hunger strikes, it is unsurprising that matters reached a crisis point – at the Derby on 4 June 1913. A year later the police again raided Lincoln’s Inn House, arresting Grace Roe. 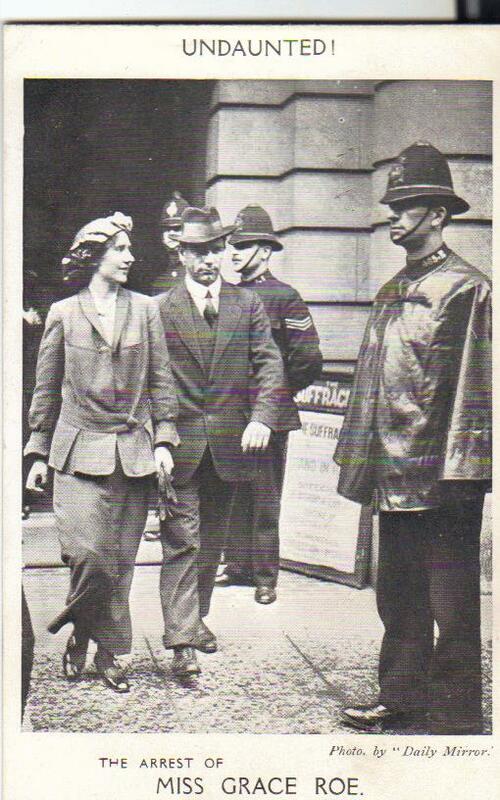 Christabel Pankhurst’s chief deputy, seen here being marched out of the building. Nearly a century later the rusticated stonework is still the same – a’ Bill’s’ menu now substituted for The Suffragette poster. This entry was posted on April 30, 2013, 2:58 pm and is filed under Suffrage Stories. You can follow any responses to this entry through RSS 2.0. You can leave a response, or trackback from your own site.